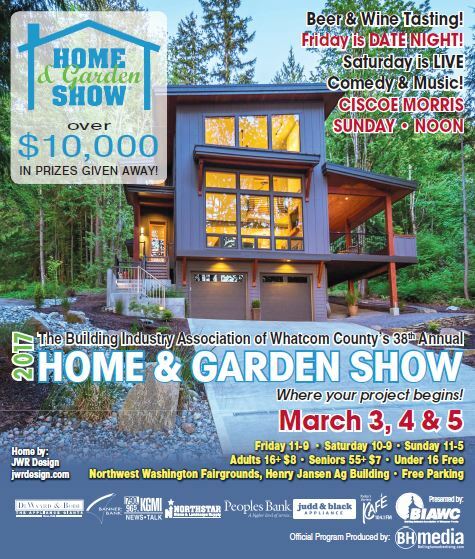 The Northwest Washington Fairgrounds, will be hosting the Whatcom County Home & Garden Show this weekend, March 2 – 4, 2018. 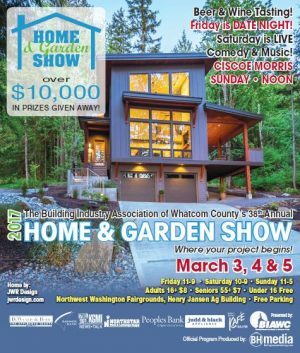 It’s the 39th show presented by the Building Industry Association of Whatcom County. Five thousand dollars in prizes will be given away throughout the event. A variety of food vendors as well as beer & wine tasting will be at the show. Friday evening is date night, and on Saturday there will be live music in the indoor garden area. More than 160 exhibitors will be present at the show. Experts on home repairs, building, gardening, landscaping, garage doors, painting, closet systems, handyman services, flooring cabinets, appliances & more will be present. If you have any Spring projects you’ll want to visit the Home Show for a myriad of ideas, newest products and advice. Hours are Friday, 11:00 a.m. to 8:00 p.m.; Saturday, 10:00 a.m. to 8:00 p.m.; and Sunday, 11:00 a.m. to 5:00 p.m.